There was so much fear and anxiety going into this match. Not just for the team and the result, but for Mihajlovic’ job and the desperate need we have for consistency. Watching the first half seemed to confirm my worst fears, as it seems to go with every first half this season. But the second season was a pleasant surprise and was actually somewhat entertaining to watch. 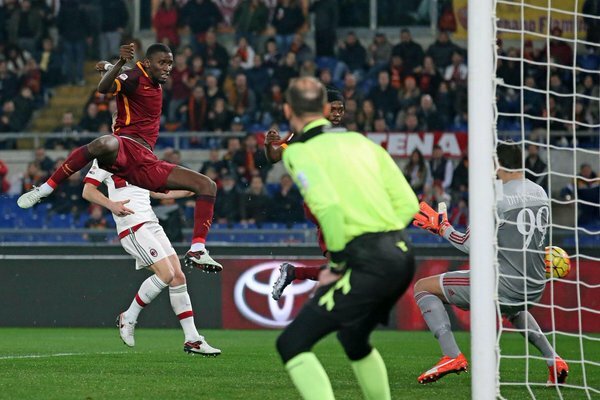 Despite the fact that Roma did not show up for much of the game, I am absolutely fine with the result. 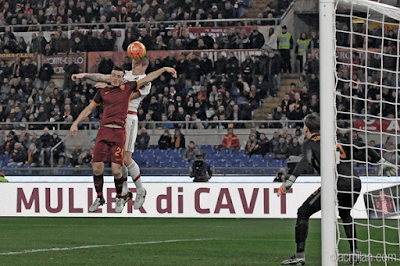 Even if we were so close to getting the three points, we were away to the Olimpico to a team with a lot of talent. So a point for me seemed just right. Okay. It’s nice when players surprise, but often just looking at the lineups, it’s easy to predict who will perform and who will make the costly mistakes. When the lineups came out, I noticed a few things. First of all, Zapata. For a player who hasn’t always played his best, and done pretty poorly his few appearances this season, I was fearful. And I was right, he was pretty shaky. Next, no Captain Longball, he was on the bench. It was some kind of miracle. Which led me to notice who was in our midfield. Neither Kuco nor Bertolacci had individually impressed me with their skills so far this season, though both of them work very, very hard. So I was most curious to see how they would do. Fourteen seconds in, Roma had their first shot on goal, with at least Donnarumma gratefully being one of the only players ready to actually play. Roma kept pressing, and it was only in the fourth minute that Rüdiger headed it in from a Pjanic free kick to give Roma the lead. 1-0. Watching that, I think I can more accurately guess what it feels like for a man to take a kick to the groin. I know the goal sent me straight to that place in m brain reserved for watching Milan these past three years. You know that place where I just shut down and try not to feel anything at all? Yeah, you know that place well, don’t you? We all do. I stayed in that place through the first half. Milan didn’t overwhelm, but they also didn’t curl up in a corner and die, either, like we did so often last year. Their confidence is definitely growing, and the performances are, too. In fact, I think Mihajlovic has got them playing his attacking style, now it’s down to really practicing it and reducing the costly errors. There may be a light at the end of the tunnel with this squad after all, if Berlusconi and Galliani can just keep their balding old heads about them and not sack the man. The second half kicked off and I braced myself, but knowing our performances have been better in the second half, I was crossing my fingers a bit. And it’s good that I did, because I was alert in the 50th minute when Honda put an exquisite cross in to Kuco, who headed it home for his first Milan goal, 1-1 all. And what a big goal it was for him. Big enough to forgive him for his miss in the 60th when Boateng sent it in to him right in front of goal, and he sent it just over. That was enough for Mihajlovic to show his frustration. Is no water bottle safe this season? He kicked another water bottle and was sent off again. Did they not remember that he told them if he’d wanted to hit the ref with the water bottle, he wouldn’t miss? I love that man. There were lots of things besides water bottles thrown or kicked around the world when Kuco missed that shot, he was not alone. And I also like that it shows how much he cares, he doesn’t just sit there and grimace like a certain ex-coach of ours. But it did make me lose my bet as to who would be sent off first. 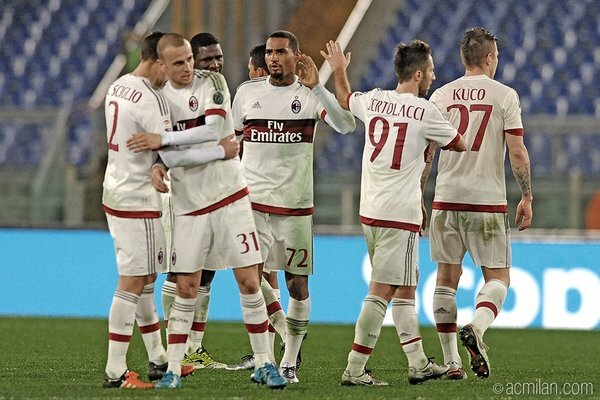 There were lots of chances for Milan – 17 shots with 6 on target. But between Bacca’s crossbar shot in the 64th and a slew of others that seemed so close, we were not destined to take all three points. And that’s okay with me. I feel like there is something tangible about the progress we’re seeing, like we are so close to seeing some real change I can almost taste it. Or maybe that was just the reprieve from Montolivo, I don’t know. But I expect he will be back for the Carpi match, as Mihajlovic maybe rested a few players in anticipation of our busy couple of weeks. All I know is that it would be a crying shame if there is a coaching change now, just as the team are finally becoming cohesive and learning to play this system and all. This was not the greatest game I ever saw, nor was it the worst. We kind of deserved to win, but then we kind of didn’t. Certainly we survived the Olimpico, and I can’t say the same for the Roma fans, their team is kind of worse off than ours, simply for dollars spent. I was pleasantly surprised with how Kuco and Bertolacci worked out in the midfield, and even more grateful that Montolivo was benched. I have no regrets from this match, and am noticeably missing the uncontrollable shaking, crying, and incomprehensible muttering that I usually have after a Milan match, so that’s good. One point away at the Olimpico. Okay.